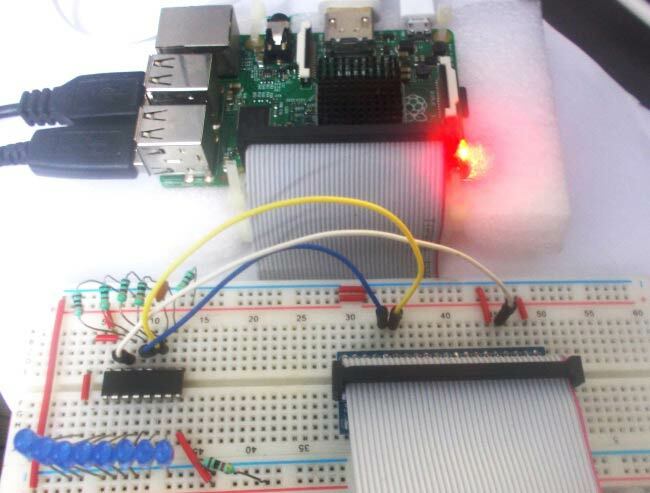 In this Raspberry Pi shift register tutorial, we will Interface Shift Register with Pi. PI has 26 GPIO pins, but when we do projects like 3D printer, the output pins provided by PI are not enough. So we need more output pins, for adding more output pins to PI, we add Shift Register Chip. A Shift Register chip takes data from PI board serially and gives parallel output. The chip is of 8bit, so the chip takes 8bits from PI serially and then provides the 8bit logic output through 8 output pins. For 8 bit shift register, we are going to use IC 74HC595. It’s a 16 PIN chip. The pin configuration of the chip is explained later below in this tutorial. In this tutorial, we will use three PI’s GPIO pins to get eight outputs from Shift Register Chip. Remember here the PINS of chip are for output only, so we cannot connect any sensors to chip output and expect the PI to read them. LEDs are connected at the chip output to see the 8 bit data sent from PI. Let’s talk about the PINS of SHIFT REGISTER we are going to use in here. They are the output pins (red rectangle), where we get 8 Bit Data parallel. We will connect eight LED to them to see the parallel output. First data is sent bit by bit to this pin. To send 1, we pull-up the DATA pin high and to send 0 we will pull down DATA pin. Every pulse at this pin forces the registers to take in one bit of data from DATA pin and store it. After receiving 8 bits, we provide pulse this pin to see the output. We will follow the Flow Chart and write a decimal counter program in PYTHON. When we run the program, we see LED Counting using Shift Register in Raspberry Pi. This command executes the loop 8 times. While 1: is used for infinity loop. With this command the statements inside this loop will be executed continuously. Further explanation of Program is given in Code Section Below. We have all instructions needed to send data to the SHIFT REGISTER now. IO.setup(4,IO.OUT) # initialize GPIO Pins as an output. IO.output(4,1) # pull up the data pin for every bit. For this project the voltage value does not matter, you can use anything you get.